I want to solve this for $x$ using law of sines if possible. From the property of triangle, the sum of the angles will be equal to $180$. Could you help me take it from there? You don't need trigonometry to solve for $x$. 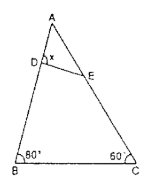 Observe that $BCE$ is an equilateral triangle, so $BE=BC$, so $BDE$ is an isosceles triangle. From this, it's easy to see that $x=100°$. Since $|BC|=|EC|$ and $\angle BCE=60$ then $\triangle BCE$ is equilateral. Hence $|BE|=|BC|=|BD|$, so that $\triangle BDE$ is isosceles with $\angle DBE=80°-60°=20°$. Hence, $\angle BDE=(180°-20°)/2=80°$ so that $\angle ADE=180°-80°=100°$. Not the answer you're looking for? Browse other questions tagged geometry trigonometry or ask your own question. $\triangle ABC$ has $AC=BC$, and $\angle ACB=96^\circ$. $D$ is a point such that $\angle DAB=18^\circ, \angle DBA=30^\circ$. What is $\angle ACD$?